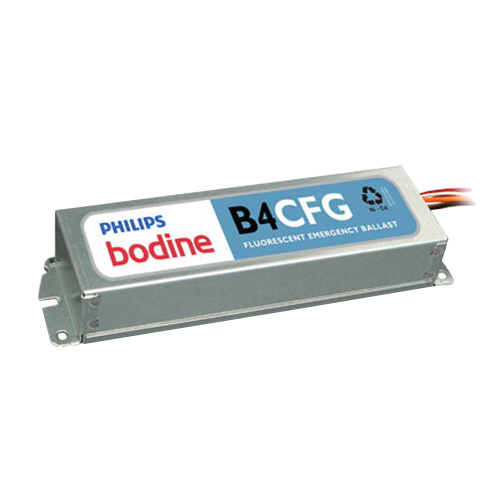 Bodine Compact fluorescent emergency lighting ballast has galvanized metal construction for long-life durability. It is voltage rated at 120/277-Volts AC, power rated at 4-Watts, current rated at 300-Milli-Amps, temperature rated at 0 to 50 deg C and frequency rated at 60-Hz. The ballast features 1-Pole test switch and supports one or two 22 to 40-Watt T5 circline or 18 to 39-Watt long CFL lamps. It is suitable for use with low mercury lamps. It includes a high temperature, maintenance-free NiCd battery, charger and electronic circuitry. The compact fluorescent emergency lighting ballast meets UL and CSA standards.